Each week we will have a new feature on TIGO called What Ever Happened To... It will most likely be a former Pirate, Penguin, Nittany Lion or whoever pops in my head while I'm at work that day. It's simple. Do a quick google search and presto... a new post. What Ever Happened To Jermaine Allensworth? 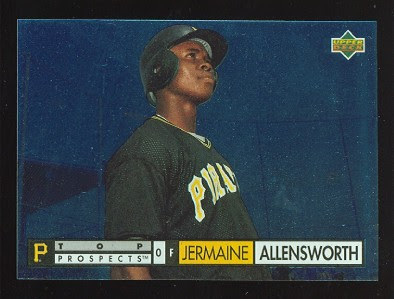 Allensworth played center field for the Pirates from 1996-1998. He was the Opening Day starter in 1997. The thing I remember most about Allensworth was a SNL skit when he was played by Tracy Morgan. Allensworth played in 238 games for the Pirates. He was a first round (34th overall) pick in the 1993 amateur draft. He was traded to the Kansas City Royals in 1998 for Manuel Bernal (who?). He last played in the majors for the Mets in 1999. He was playing for the Schaumburg Flyers of the Northern League until he was placed on irrevocable waivers on May 12, 2009. So up until May, he unbelievably was still playing ball. He was a career .260 hitter in the majors with average speed and little power. That's probably why he spent 4 seasons in the bigs and 13 in the minors. That's the story of Jermaine Allensworth.